SCRAMBLING FOR YARDAGE - Manvel quarterback Josh Coltrin (11) gets past the Huntsville defensive rush for a few yards. Coltrin was 24-of-41 passing for 268 yards and one TD and one INT as the Mavs fell 34-10 in the Class 5A Region III Div. II contest. 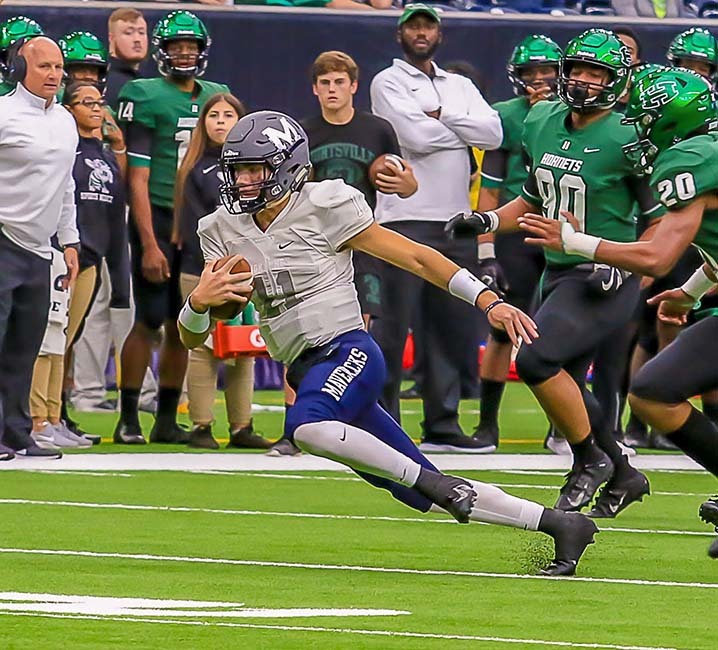 MANVEL — There were a lot of uncharacteristic things that ended Manvel's 2018 football season with many of them self-inflicted. First of all, the 10 points scored by the Mavericks was the lowest number of points in all 36 all-time playoff games. The Mavs were averaging 58.5 points per game heading into their game against Huntsville. It's also the earliest post-season exit for the Mavs, who were in the Class 5A Div. I state title game last year, where they lost at AT&T Stadium to defending state champion Highland Park in a heart-breaker 53-49. Unfortunately, Manvel self-imploded against the Hornets to end their season at 9-3. "In the first half, we had 93 yards in penalties," Manvel head coach Kevin Hall said. "That's inexcusable for four quarters of football much less two." Hall says there won't be any what-ifs with this game – Huntsville won soundly. One can see the marks of defeat when they look at the Manvel statistics without having to look at the score. 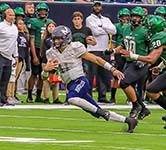 Manvel fumbled four times, losing two with one setting up a Huntsville touchdown. The first half was marred by penalties as the Mavs had 10 miscues (93 yards) while finishing the game with 14 for 118 yards. The Mavs also had four pass interference calls on defense that helped Huntsville keep drives alive. Huntsville scored first on a 36-yard field goal by Nathan Batten on their first possession of the game at the 10:43 mark of the first quarter for a 3-0 lead. Manvel responded with a 12-play drive from their own 35 to the Huntsville 26. Facing a fourth-and-14, Manvel QB Josh Coltrin threw a pass into the end zone that was intercepted by Huntsville's Terrence Sweat. The two team continued to battle with each trading out punts. With 2:06 left before the end of the first quarter, Huntsville set up their offense at their own 42. Four plays later, the Hornets found the end zone with 1:00 minute left in the opening period on a 33-yard pass from QB Matthew Southern to Dedric O'Bryant for a 10-0 lead. Manvel answered with a drive of their own as Coltrin hit Roland Kimble on a 9-yard short pass for the touchdown. Luis Moreno booted the PAT to close the gap to 10-7 with 10:41 left in the second period. After trading a couple of punts, Huntsville got a defensive break when Coltrin and Ladarius Owens collided on a handoff resulting in a fumble that was recovered by the Hornets as the Mavs 25. Huntsville running back finished off the 5-play, 25-yard drive with a 2-yard run with 5:34 left before intermission for a 17-7 lead. Manvel was able to get a 34-yard field goal from Moreno to close the gap to 17-10 at halftime. It was all Huntsville in the second half who scored 17 unanswered points with 14 coming in the third quarter to get the 34-10 playoff win. The Hornets defense was swarming in the second half that held the Mavs scoreless. Manvel was held to only 92 yards of offense in the second half. Coltrin was 24-of-41 for 268 yards and one TD and one INT. Eric Hebert had nine grabs for 104 yards.